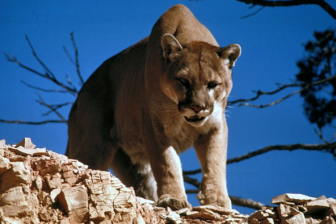 A New Canaan woman on Monday saw a mountain lion while walking her dog in the northern part of the town, and New Canaan Police are classifying her report as a credible cougar sighting, the third in 2018. Officer Allyson Halm, head of the New Canaan Police Department’s Animal Control section, called for residents in the area of Briscoe and North Wilton Roads to check surveillance videos for images of the animal. North American mountain lion, also known as a cougar, in Glacier National Park in Montana. The sighting, by Margaret Cooper of Briscoe Road, follows one in April on Marvin Ridge Road and another in January on Nursery Road (both, unlike this siting, in the southern end of New Canaan, near Darien). Cooper said the mountain lion emerged about 20 to 30 yards away, from a property across the street from her home. About the 3.5 to four feet tall, auburn in color with a long tail, high hindquarters and the head and gait of a cat—all telltale signs of mountain lions, as opposed to bobcats—the cougar “just sauntered across the road and never looked in our direction,” Cooper told NewCanaanite.com. “It didn’t seem to pay any attention to us at all,” she said. She did not take a picture of the animal. Mountain lions have been known to travel through Fairfield County in the past. Two years ago, a woman claimed to see a mountain lion on a Fox Run Road property in New Canaan, though state officials said they were unable to confirm the sighting based on paw prints left by the animal. New Canaan police say they received a credible report Thursday of a mountain lion sighting on Marvin Ridge Road, which is about a mile northeast of the northeast corner of Darien. The 7:30 a.m. sighting of the cougar crossing a backyard comes about three months after the last one and just a few houses away, according to Officer Allyson Halm, head of the New Canaan Police Department’s Animal Control section.